The Squeakquel Movie Teaching the Moves...Dance Moves That Is! My girls are LOVING their Squeakquel Movie Soundtrack as it's great entertainment for both kids and parents. 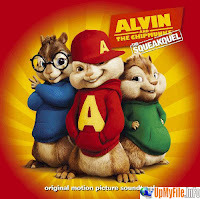 Featuring chipmunk'd renditions of classics from Beyonce, Katy Perry, the Bee Gees and many more, Alvin, Simon, Theodore and their girlfriends, The Chipettes, provide hours of fun for everyone. Every time they hear it, they start dancing and singing. It's so amusing watching my two year old jamming to it and they both love Singles Lady and can try to imitate the Chipettes in dancing based on what they know of the video. I think it's a great soundtrack to bring out their creativity, love for music and just an ability to get up and move around to be more active. If you haven't purchased your copy of The Squeakquel Movie Soundtrack, it's available here and here. I am now a follower of you great blog. Love it!!! I will check in on a daily basis.